Portishead is a coastal town in England about 120 miles west of London. The town of 22,000 people experimented with turning its traffic lights off on a major road in September 2009. Despite the traffic chaos, the streets still seemed safe. The removal of the lights in Portishead, a city that has grown quickly in the last decade, was part of a four-week study “to solve long-standing congestion at the junction,” which was so debilitating and disruptive it sparked street protests and political campaigns from frustrated residents. For the trial period, roads were monitored using cameras to see the impact of no traffic signals on congestion. (A 20 mile-per-hour speed limit was instituted over that same period.) In the video and in comments on articles about the initiative, residents said there have been big improvements—drivers pay more attention to the road and nearby pedestrians as opposed to traffic lights. Plus, there are savings, as each traffic lights usually costs 30,000 to 50,000 pounds to maintain. These lightless traffic junctures are known as “naked streets.” Trial projects that challenge the importance of traffic lights have occurred in other areas of England and Europe. (The first traffic signal, according to this video report, was erected in London in 1868.) The Portishead experiment is not alone in its redesign. Transport for London (TfL) worked to remove lights in the central downtown with hopes of getting rid of as many as 20 percent of existing traffic lights with support from Mayor Boris Johnson. Recently the city aimed to eliminate 145 lights it deemed useless. The original example is Drachten, a town in Holland of 50,000 people. It is home to exactly zero traffic lights. Even in areas of the town with a traffic volume of 22,000 cars per day, traffic lights have been replaced by roundabouts, extended cycle paths and improved pedestrian areas. The town saw accidents at one intersection fall from 36 over a four-year period to just two in the last two years since the lights were removed in 2006. 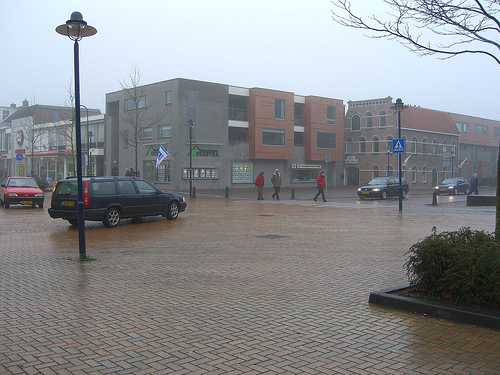 A Hans Monderman-designed streetscape in Drachten, Holland without traffic lights, road signs and lane markers. Photo by Jerry Michalski. When a driver doesn’t know who exactly has right of way, he or she seeks eye contact and reduces speed. These “naked streets” without traffic lights, road signs, barriers and other traffic controls forge shared streetscapes where cluttered space is replaced with common sense. These approaches are part of efforts to create walkable streets and design road conditions for multiple uses, not simply car driving. At the end of the video, the producers state that removing lights is one step closer to a civilized sustainable culture. They could be right. A number of studies, experts, and urban residents say streets without traffic lights can be safer. However, traffic light removal must carefully take pedestrians into account. Residents, journalists and planners have voiced dissent of the approach and, in particular, question its viability to vulnerable and disabled pedestrians. You can find another article on London’s plans to manage traffic through such efforts here.